News outlets large and small are turning to paid-membership models in search of the financial security that digital ads have not provided. A Dutch news startup has crowdfunded more than $1 million for a U.S. version of its reader-driven news model, in which journalists will be expected to spend as much as 40 percent of their time talking to readers about what they should cover. But the project has only days left to reach its goal of $2.5 million by Dec. 14. “It sounds better in Dutch,” Wijnberg joked. The “antidote,” as Wijnberg puts it, is to ditch much of what makes up the modern news economy, in particular ads and breaking news. The company hopes to “unbreak” news, a goal that points both to its rejection of advertising and its editorial vision of eschewing the latest headlines in lieu of educating readers about “the most important developments and underlying forces that shape our world,” as the startup’s website states. Readers are called “members” rather than subscribers because they are meant to work with The Correspondent’s journalists to provide insight, expertise and perspective on how to cover major stories. The goal is to create the kind of reader-journalist community that many media organizations have tried to build since the advent of the internet — but has thus far remained elusive. The Correspondent’s effort comes at a time when news outlets large and small are turning to subscriptions and paid-membership models in search of the financial security that digital ads have not yet provided. On Monday, The Wall Street Journal reported that Verizon was considering a paywall for HuffPost, which was built on massive scale and display ads. The question for The Correspondent (as well as every other media outlet rolling out a paywall) will be whether it can attract enough support to be financially viable. Wijnberg said that the company set the $2.5 million goal without a backup plan, and that members will get their money back if the full amount isn’t raised. In the U.S., people can pay whatever they like to become a member. In addition to the more than 16,000 people who have already paid to be founding members, The Correspondent also has a group of influential, unpaid “ambassadors” including activist DeRay Mckesson; Wikipedia founder Jimmy Wales; tech journalist Om Malik; investor and entrepreneur Esther Dyson; Hollywood producer Judd Apatow and many others, who have been putting out calls for support. The company’s most successful public/private collaboration came when it called on readers to pass on information about the Shell oil company, spurring dozens of former Shell employees to reach out. Eventually, he was given a box of old internal documents that showed the company was worried about climate change as early as 1986 and that a company film from 1991 entitled “Climate of Concern” showed Shell was aware of the impact of fossil fuels. 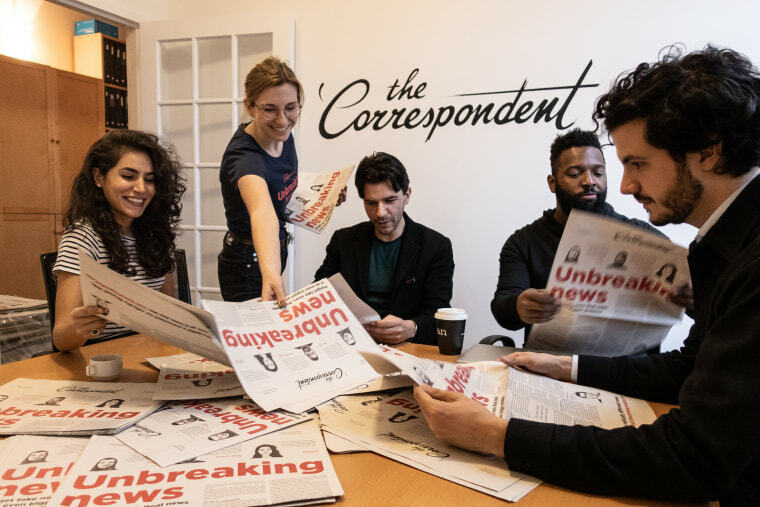 The Correspondent’s coverage, if it launches, will focus on big-picture stories and topics, which Wijnberg said has worked in the Netherlands and is even more needed in the U.S. The company has also shown a willingness to respond to its members, even when put in a difficult position, such as when De Correspondent released details of its internal financials in September. Jay Rosen, professor of journalism at New York University and an unpaid adviser to The Correspondent, has been studying efforts to foster community-driven journalism since the 1990s. He said that while plenty of such efforts have failed, The Correspondent has a chance to succeed — noting its journalists will be expected to spend “30 to 40 percent” of their time interacting with members through The Correspondent’s website, which has been built with that goal in mind.